Kids Inflatable Pools & Slides. 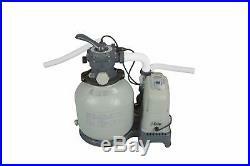 Intex 1600 GPH Saltwater System & Sand Filter Pump Swimming Pool Set 28675EG. 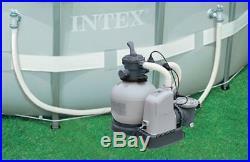 Brand New Intex 1600 GPH Sand Filter Pump & Saltwater Water System Model 28675EG! Designed specifically for Intex Above Ground Swimming Pools, Intex Sand Filter Pumps are simple and easy to setup. The Intex Sand Filter Krystal Klear pool pump provides an eco-friendly and low-cost option for swimming pool filtration. With virtually no maintenance, your sand only needs replacement every five years. While the sand filter is cleaning the pool, undetectable levels of natural swimmer safe chlorine is produced when environmentally friendly natural salt is added to the pool water and it passes through titanium coated electrolytic cells during the filtration process. The result is soft, &###xA0;fresh, clean water without the potential harsh side effects of packaged pool chemicals. The Copper Ionization feature produces highly active disinfectant ions are also released which creates a potent biocide that attacks algae more aggressively than chlorine or other packaged pool chemicals. Copper is an all natural bateriacide. The 1600 GPH Krystal Clear Sand Filter & Saltwater Combo from Intex features a powerful 1600 GPH motor (1500 GPH System Flow Rate), 6-way valve, pressure gauge and a built-in timer. This 28675EG meets the UL standards, and it is an excellent upgrade to the filter cartridge system on your Intex Above Ground Swimming Pool (Easy Set, Metal Frame and Ultra Frame -- up to 8,500 gallons). Get ready for cool, clear water and less hassle for this season and years to come! This Filter Pump System is designed for use with Intex brand swimming pools with 1 1/2 plumbing. Intex brand pools say "Intex" in large white letters on the pool wall. If your pool does not say "Intex" on the pool wall, it is NOT an Intex brand pool. We do not guarantee fitment with any other brand of pool or any non pool application. 14&###x201D; Krystal Clear&###x2122; Sand Filter Pump & Saltwater System Nature&###x2019;s own answer for cleaning water &###x2013; sand! Sand is economical, abundant and environmentally friendly. Requiring virtually no maintenance, the filter sand need not be replaced for 5 years. 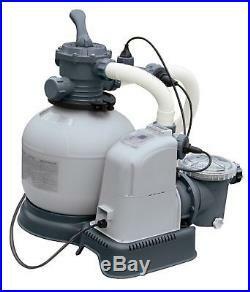 This 14&###x201D; (360mm) sand filter pump is best suited for Intex above ground pools up to 8,500 gallons. Powerful pump with leaf basket for all your pool filtration and vacuuming needs. 6 Settings &###x2013; Standard Filtration, Backwash, Rinse, Re-circulate, Drain, and Close. Saltwater system combines a unique two-stage technology to sanitize your pool. 14&###x201D; (360mm) Heavy-Duty Tank, 55 Lb. 1,600 gallon per hour pump flow rate, 1,500 gallon per hour system flow rate. 24-hour Auto Timer for extra easy pool maintenance. 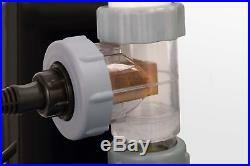 1 &###xA0;Intex Krystal Clear 1600 GPH Sand Filter Pump & Saltwater System - Model 28675EG - 110-120 Volt. 2 - 1 1/2 diameter hoses. We deliver to 85% of the Continental US in 3 Days or less! We truly appreciate your business! Windy City SuperStore is here assist you. Please see individual item return policies for specific details. We will do our best to accommodate your request but we cannot guarantee the order will be cancelled. Tracking numbers are not "active" until the order is scanned into the carrier hub in the evening. This listing is currently undergoing maintenance, we apologise for any inconvenience caused. The item "Intex 1600 GPH Saltwater System & Sand Filter Pump Swimming Pool Set 28675EG" is in sale since Thursday, August 11, 2016. This item is in the category "Home & Garden\Yard, Garden & Outdoor Living\Pools & Spas\Pool Equipment & Parts\Pool Pumps". The seller is "windycitysuperstore" and is located in Round Lake, Illinois. This item can be shipped to United States.